ASUS’ new budget performer the X550VX, or known as K550VX in Europe, delivers unmatched power for the asking price and it’s an ideal choice for gamers on a budget. But, of course, $800 for Core i7-6700HQ CPU with a NVIDIA GeForce GTX 950M (2GB GDDR5), surely there are some trade-offs. In this case, it’s the screen. The only available screen options are with TN panels and most of them feature HD (1366×768) resolution. Full HD is optional. This makes the notebook so lucrative for users valuing power on the go but when it comes to gaming, an external monitor is essential for good gaming/multimedia experience. While the X550VX offers a GTX 950M GPU with GDDR5 VRAM, HP’s performance-centric version of the Pavilion 15 and the much more expensive Lenovo Ideapad 700 bring the standard DDR3 VRAM version of the graphics chip. One thing is for sure, though, X550VX’s performance is unmatched in this price range. The notebook comes in a small box containing all of the usual manuals, DVD with drivers, AC adapter and power cord. As you may have already noticed, the X550VX doesn’t offer anything special in terms of design and build quality because the machine is performance-centric so therefore, there are some cut corners. Plastic is the only material found on the chassis and understandably, a few build inconsistencies can be found. Let’s start with the lid. 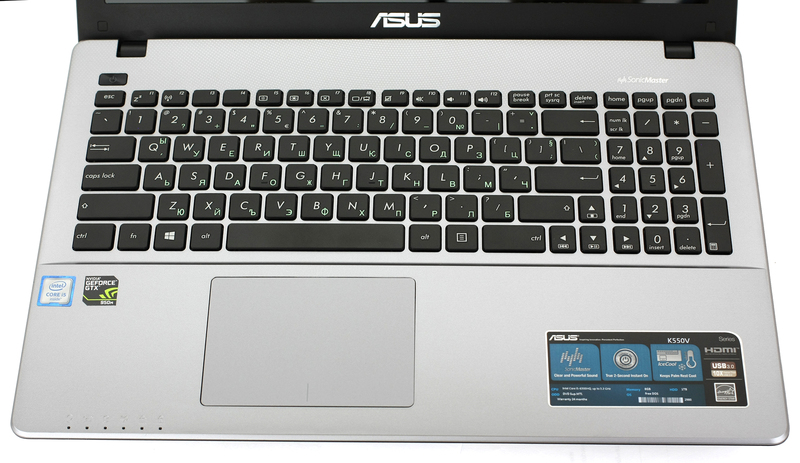 It strongly resembles the appearance of the ASUS K751LX we’ve reviewed some time ago but the red stripe pattern is missing this time. Glossy surface spans across the whole lid, which is easy to twist, bend and attracts a lot of fingerprints and smudges. Frequent cleaning should do the trick, though. 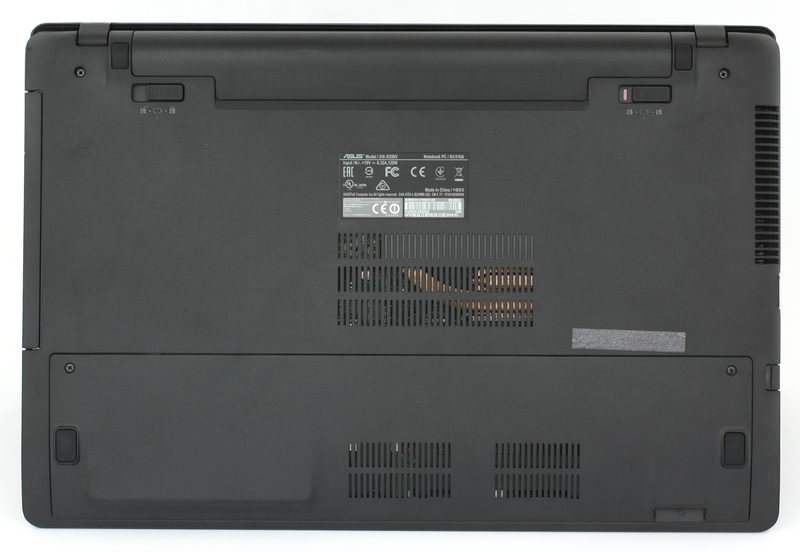 The screen is supported by two small hinges positioned near the edges giving enough stability when typing or moving the notebook around but appear to be a bit stiffer than we like them to be. Still, it’s better this way than letting the lid freely sway when working on the laptop. The bottom piece is made of rough black plastic featuring the usual vent openings for extra airflow along with a big service hatch. 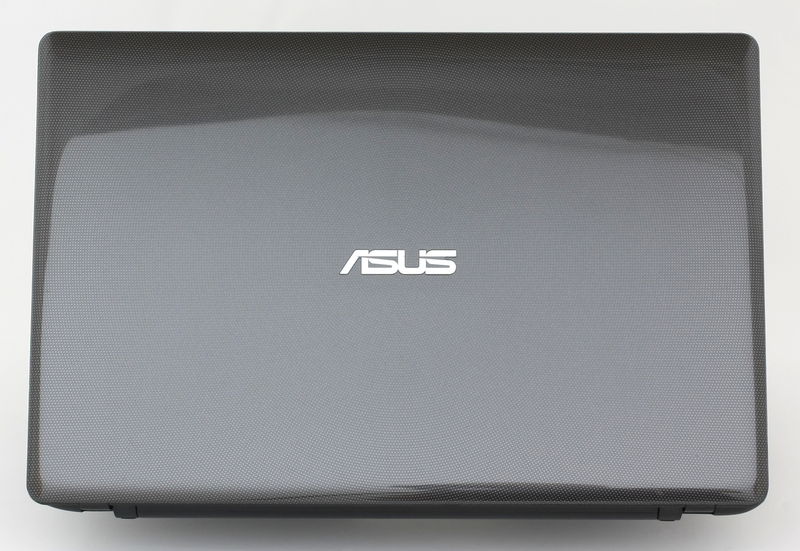 It gives access to the usual RAM and 2.5-inch HDD. The sides are relatively thick – 31.7 mm but it can be considered as normal for the asking price. We are delighted by the “healthy” port distribution as the left side adopts the main exhaust vent, DC charging port, VGA, HDMI, LAN, 3.5 mm audio jack and two USB 3.0 ports. As for the right side, it has the optical drive and the other USB 2.0 connector. This way the connected peripherals won’t get in the way when gaming or doing work with an external mouse when the working space is small. The sides adopt the same hard plastic as the bottom. We find the interior rather interesting. It has an unusual dotted pattern and at first glance, it can be mistaken with metal but the minute you touch it, you will know. It feels kind of thin and poorly reinforced resulting in fairly easy bending, especially in the keyboard area. While the keys have long travel and decent feedback, the sponginess of the area kind of takes all that good experience away. And as for the touchpad, it’s accurate and comfortable to use with the little exception of being a bit too stiff when pressing for mouse clicks. 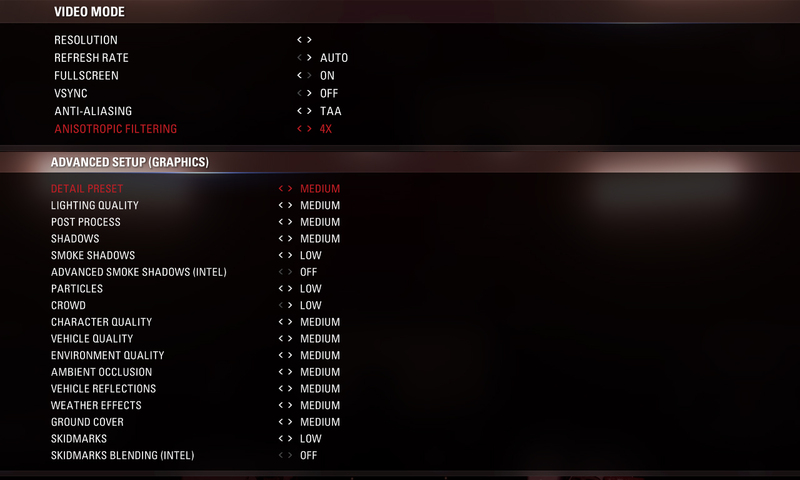 Also, the touchpad drivers are rather bad so we suggest downloading the latest drivers as soon as you get the machine. Otherwise, you will be met with frustrating cursor jumping around the screen and unregistered mouse clicks are a common issue as well. All in all, the trade-off between build quality and hardware is apparent in some areas like the lid and interior but that’s the price you will probably have to pay when getting a Core i7-6700HQ (or Core i5-6300HQ) and GTX 950M (with GDDR5 VRAM)-powered laptop costing a few hundred bucks less than the competition. 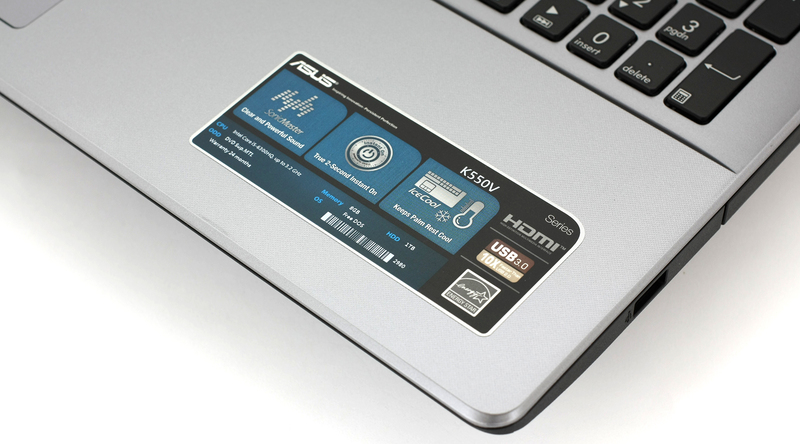 The general hardware eligible for an upgrade can be accessed via the maintenance lid quite easily. 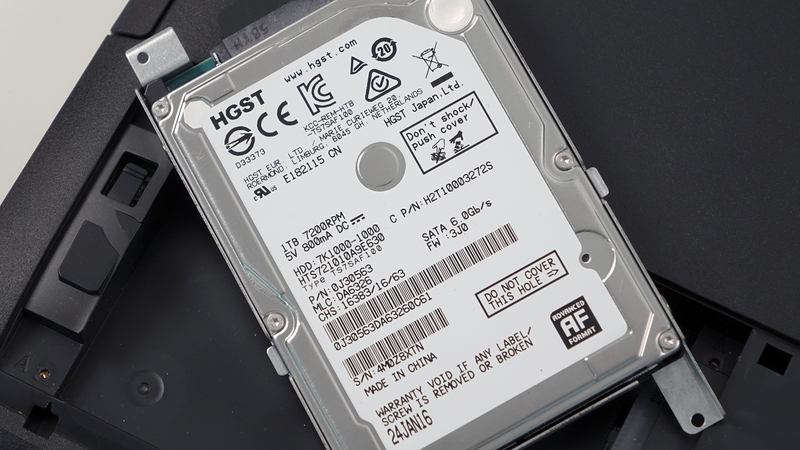 Under it, you will find the 2.5-inch drive along with one RAM slots and the soldered 4GB chip as well. Quite typical for a budget laptop, this one doesn’t support any M.2 SSD sticks and only offers the usual 2.5-inch HDD on board. The motherboard incorporates a soldered DDR4-2133 RAM chip but can hold up another 8GB chip for a total of 12GB RAM. 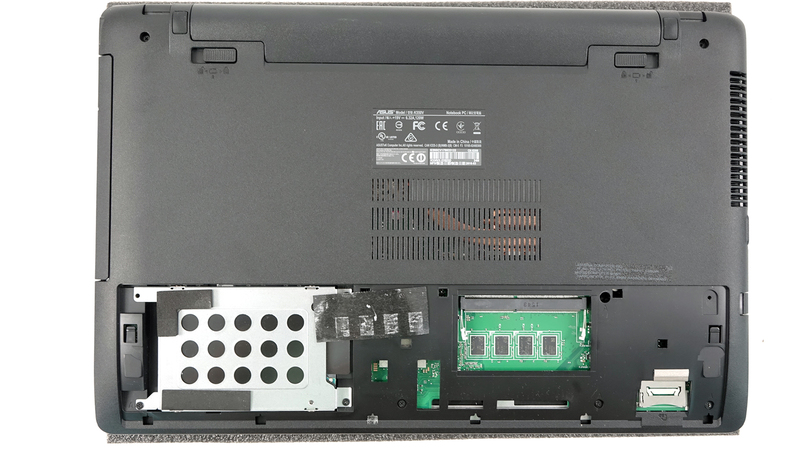 In order to access the rest of the laptop, you need to perform a full disassembly by unmounting the whole back of the machine. 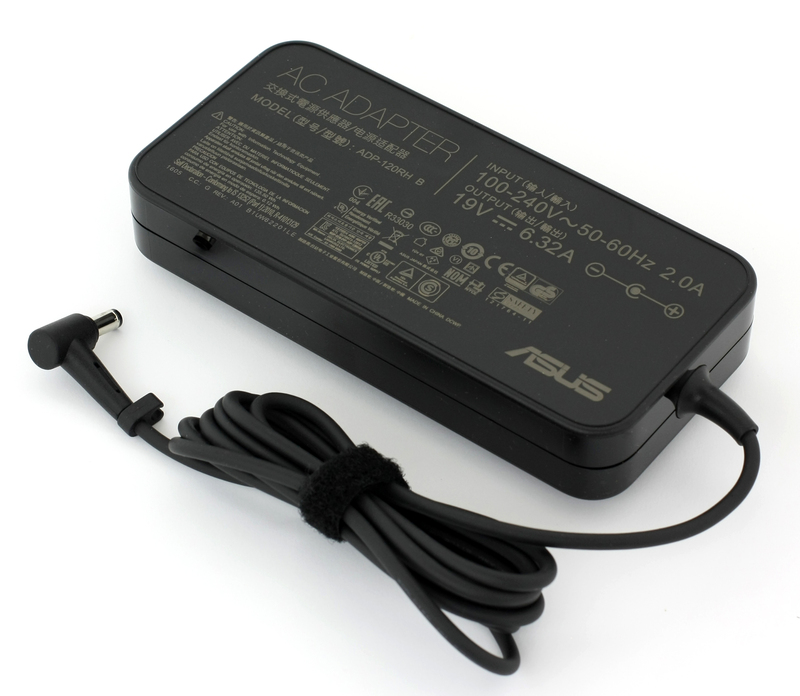 Luckily, the battery is user-replaceable and can be changed without the need of any tools at all. It’s rated at 44ВWh. 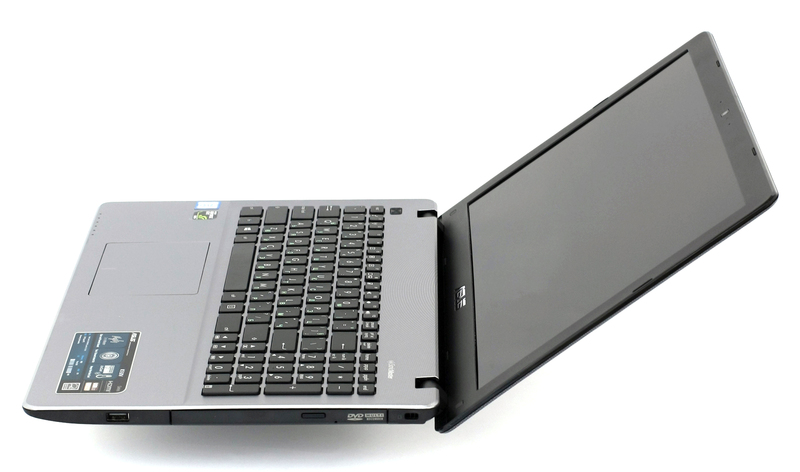 The notebook uses a TN HD (1366×768) display manufactured by Innolux with model number N156BGE-E42. Since it has a 15.6-inch diagonal, the pixel density is just 100 ppi while the pixel pitch is 0.253 x 0.253 mm. It can be considered as “Retina” when viewed from a distance equal or greater than 86 cm. Due to the TN matrix, viewing angles are limited. We measured a maximum brightness of 215 cd/m2 in the middle of the screen and 204 cd/m2 as average value – around 11% maximum deviation. Due to the glossy finish and limited maximum brightness, there might be some issues with the reflection. We also measured the color temperature – 7040K in the middle and 6950K across the surface and this is still pretty close to the optimal 6500K. The contrast ratio is 460:1. 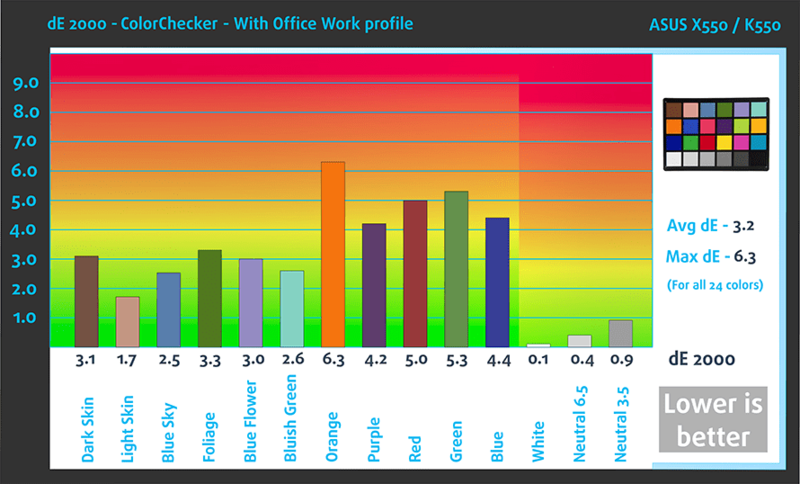 The maximum color deviation is relatively low – dE2000 is equal to 2.7 out of 4.0 (anything above 4.0 is unwanted) in the lower right corner. 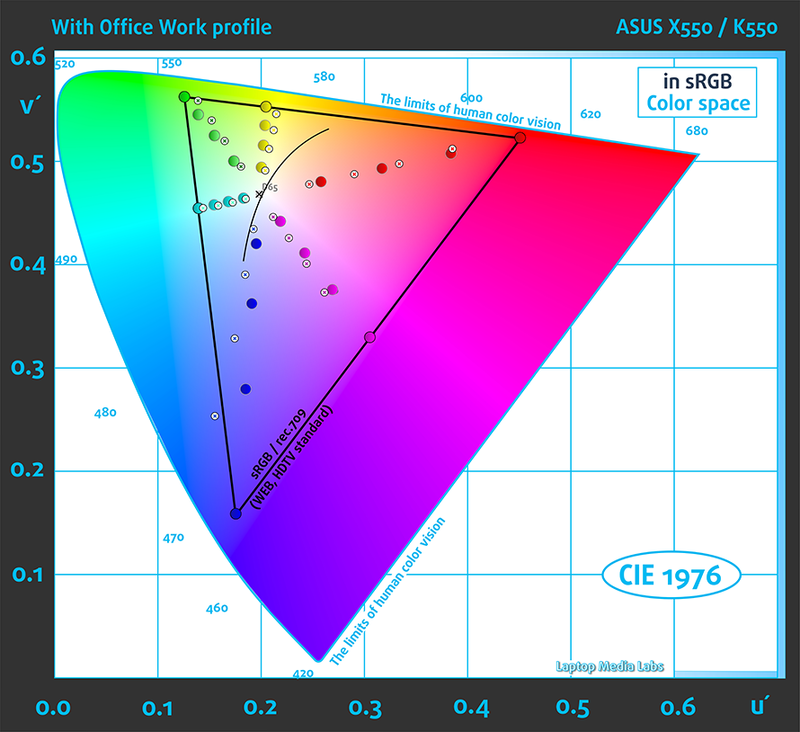 The notebook’s display delivers 51% of the sRGB color gamut so almost half of the web-based colors will be missing. The screen will still be useful for normal office work and browsing. We created the profile at 140 cd/m2, 6500K white point and sRGB gamma mode. We recorded Fall Time + Rise Time = 15 ms. Despite the relatively decent properties of the display, a strong con creeps up in the form of aggressive PWM. The frequency of the emitted light is really low (200 Hz) and will probably affect even users with not so sensitive eyes. 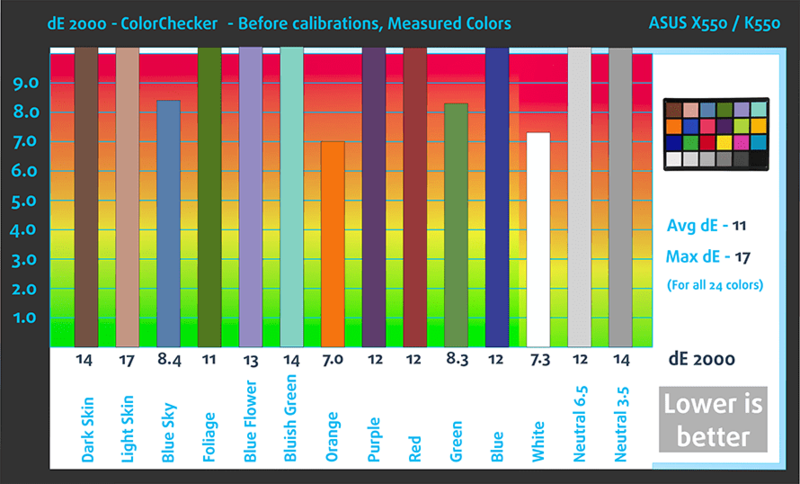 Installing our Health-Guard profile not only eliminates PWM but also reduces the harmful Blue Light emissions while keeping the colors of the screen perceptually accurate. If you’re not familiar with the Blue light, the TL;DR version is – emissions that negatively affect your eyes, skin, and your whole body. You can find more information about that in our specialized article on Blue Light. The overall quality of the screen isn’t surprising for its price range and we can easily call it average. Probably the only considerable downside would be the glossy finish and low maximum brightness. Both don’t get along too well. Moreover, the panel uses PWM from 0 to 99% screen brightness so if you have sensitive eyes, you are stuck with 100% brightness at all times, unless you install our Health-Guard profile, which not only eliminates the PWM but also limits the negative blue light emissions. The sound quality is okay without any major distortions at low and high frequencies. The specs listed below are for the tested unit only and may differ from your’s. 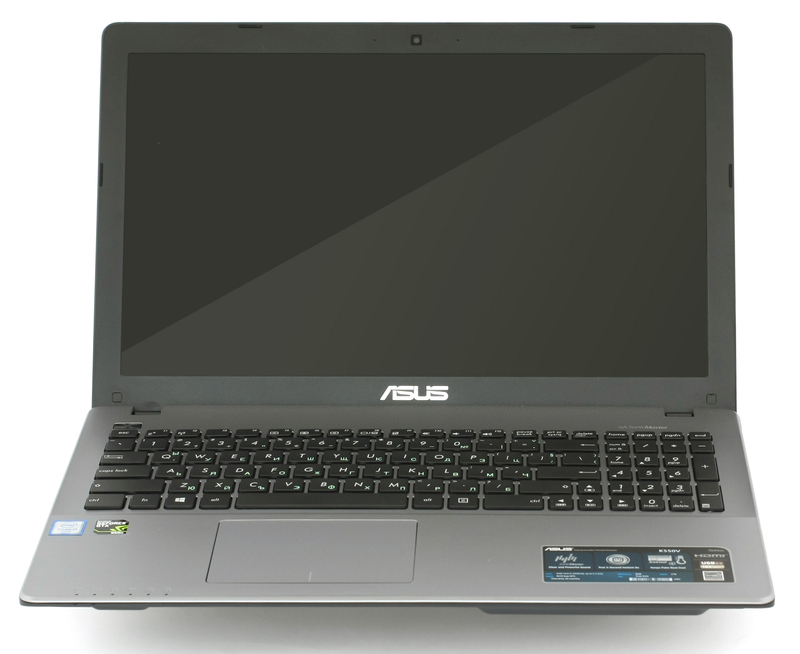 We used a freshly installed Windows 10 (64-bit) and if you wish to perform a clean install of the OS as well, we suggest downloading all of the latest drivers from ASUS’ official support page. Quite expectedly, the laptop lacks the needed battery capacity to support the demanding hardware. 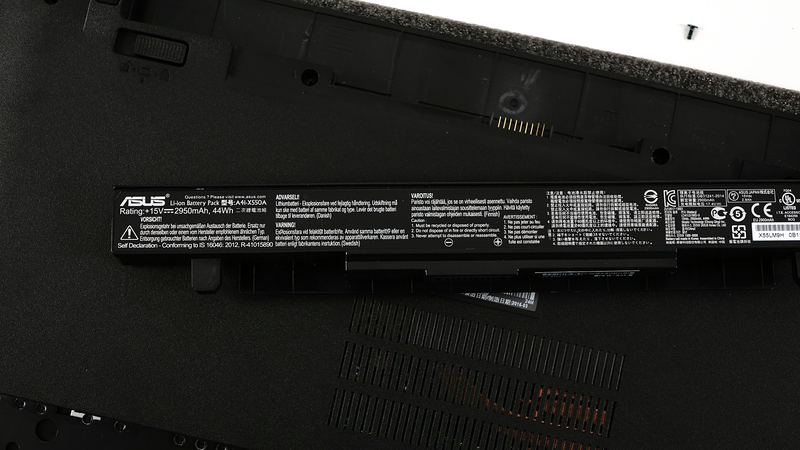 The battery is rated at just 44Wh and compared to other similarly priced notebooks like the Acer Aspire E5-575G or the ASUS X556 but obviously, the X555VX isn’t designed for endurance. Anyway, we ran the usual tests with the following settings: Wi-Fi turned on, Windows battery saving feature turned on and screen brightness set to 120 cd/m2. We’ve got below average web browsing result from the laptop – 265 minutes (4 hours and 25 minutes). Slightly lower and again below average result – 227 minutes (3 hours and 47 minutes). That should be more than enough for a full movie. Even though gaming without a charger isn’t the smartest thing to do, you can still get a little more than an hour and a half of play time if you have to – 93 minutes (1 hour and 33 minutes). Intel Core i5-6300HQ represents the Skylake family and it’s considered a high-performance chip with normal voltage and TDP of 45W. 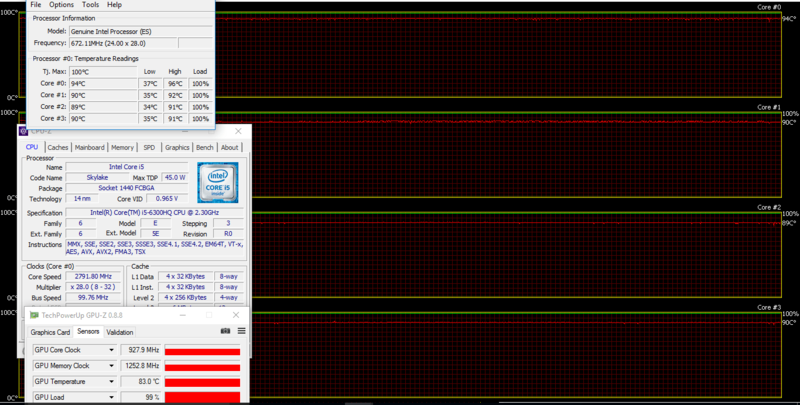 The Core i5-6300HQ has four cores ticking at 2.3GHz and can go up to 3.2 GHz for one active core, 3.0GHz for two active cores and 2.8 GHz for four active cores. Although it’s a part of the Core i5 line, it’s just ~15% slower than Intel Core i7-4702MQ and it’s ~50% faster than Intel Core i5-4300M. 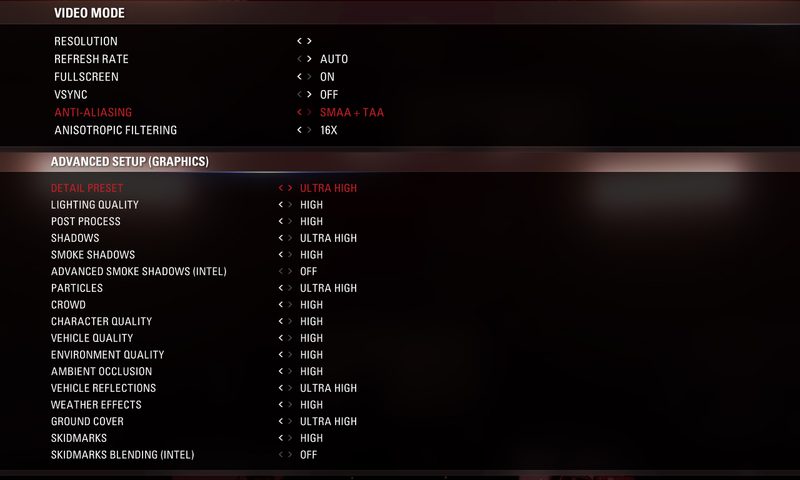 This makes Core i5-6300HQ the perfect choice for gaming machines, where one would want to spend their budget on offerings with a more powerful GPU, but wouldn’t want to compromise too much in terms of computing performance. Furthermore, the chip is manufactured using a 14nm FinFET process and integrates an Intel HD Graphics 530 GT2 GPU with 24 EU (Executable Units) clocked at 350 – 950 MHz. The memory controller supports up to 64GB of DDR3 or DDR4 RAM at 1600 or 2133 MHz, respectively. The CPU is suitable for heavy applications and gaming. Fritz is a chess benchmark that tests the computing capabilities of the CPU with various chess moves. 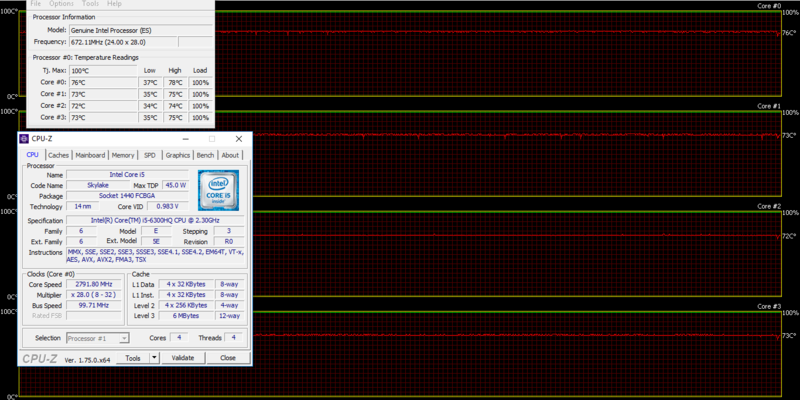 The Intel Core i5-6300HQ managed to get 8.803 million moves per second. In comparison, one of the most powerful chess computers, Deep(er) Blue, was able to squeeze out 200 million moves per second. In 1997 Deep(er) Blue even beat the famous Garry Kasparov with 3.5 to 2.5. Announced back in 2015, the GeForce GTX 950M GPU is part of NVIDIA’s Maxwell family and it’s a direct successor to the 850M GPU. It’s manufactured in 28nm and can be found in two variants – with standard DDR3 VRAM and with GDDR5. 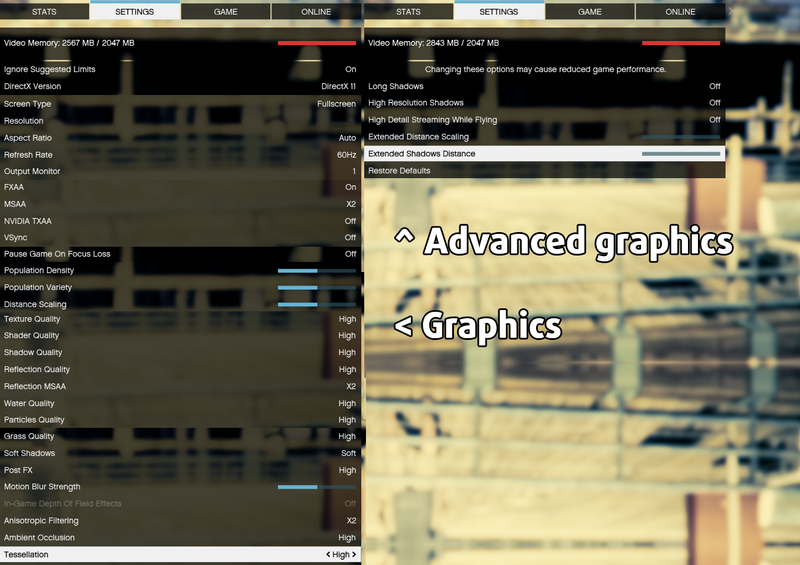 Aside from the memory difference, both variants largely the same specs – GM107 GPU core clocked at 914 MHz going up to 1124 MHz using 128-bit (5000 MHz effective clock) GDDR5 memory. 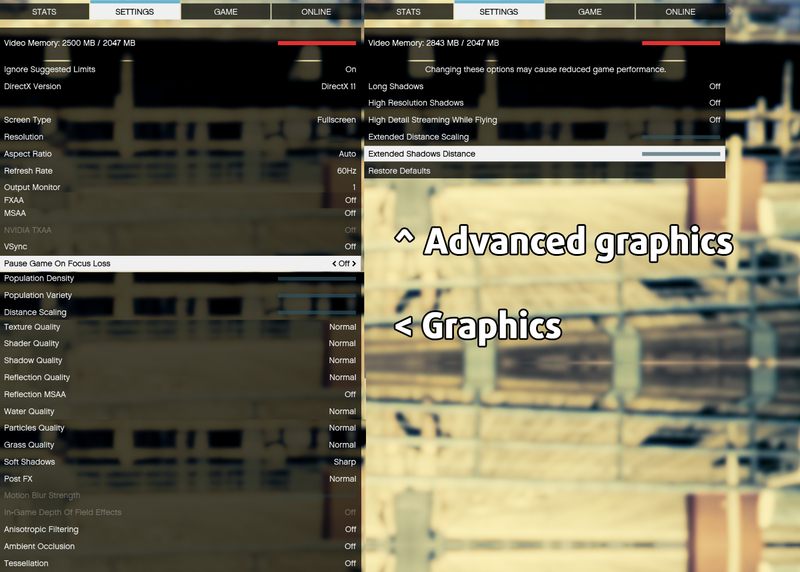 Also, the shading units, TMUs, and ROPs remain unchanged but the use of GDDR5 boost the performance of the GPU significantly. 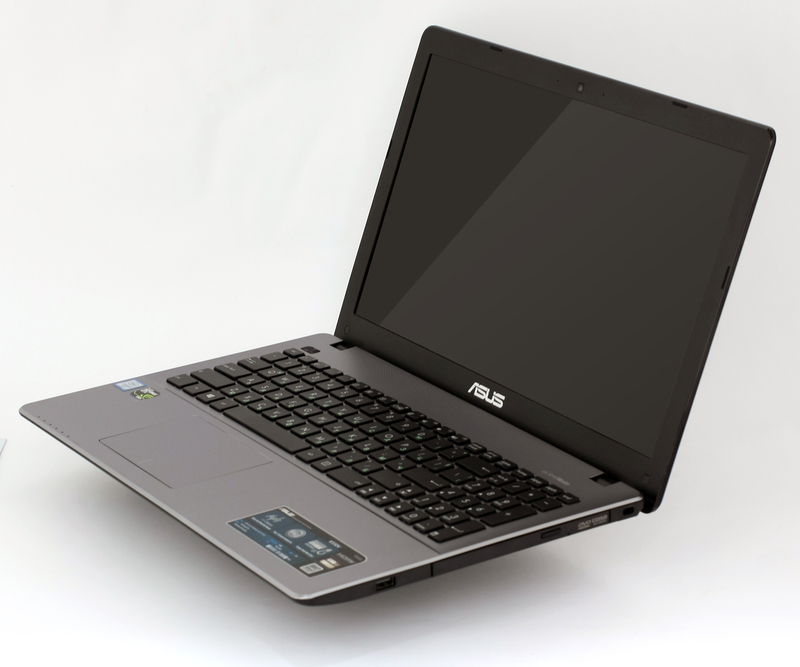 The GTX 950M with GDDR5 memory should perform much better than its DDR3 counterpart and 15% slower than the GTX 960M making it an ideal choice for budget-friendly 15-inch or 17-inch laptops. Some of the features include 6th generation PureVideo HD (VP6) video engine for better decoding performance of H.264 and MPEG-2 files. 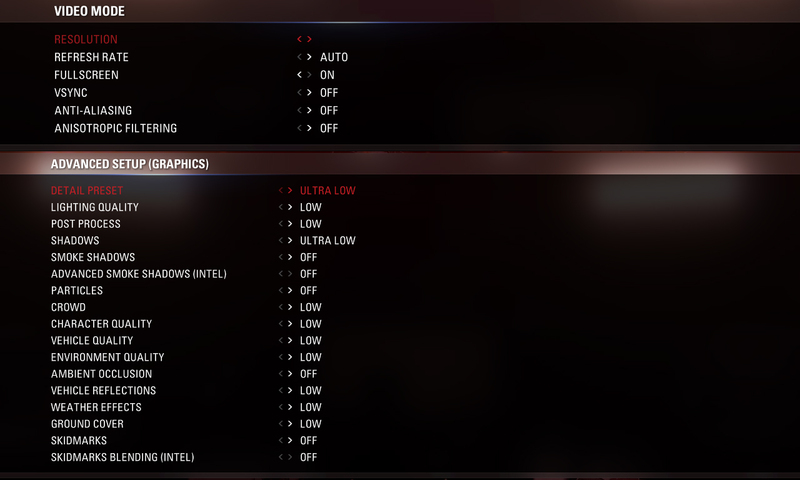 This two-staged test isn’t a good representation of real-life use because the general user won’t be able to reach 100% CPU and 100% GPU load for most of the time but at the same time, it will give us a good glimpse of how the cooling system performs and how the machine will fare in the long run. We kick things off with 100% CPU load for about an hour. The CPU was able to reach its full potential of 2.8 GHz for four active cores while maintaining temperatures around 75 °C. 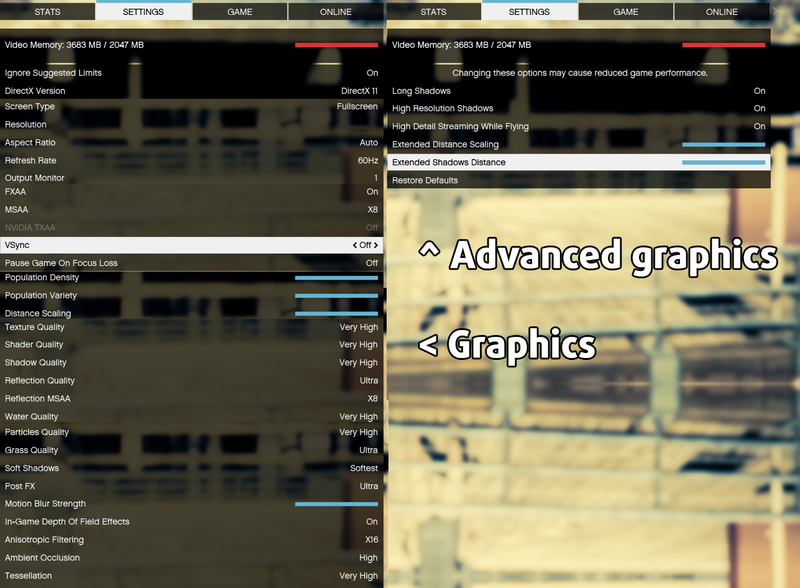 After an hour or so, we started the GPU stress test as well and things drastically changed. The silicone reached temperatures as high as 92 °C while the GPU was running slightly hotter than we are used to seeing – 83 °C. However, no thermal throttling occurred which is definitely a good sign. Still, the heat on the surface of the notebook can be easily felt on the left side where the main exhaust vent is placed. 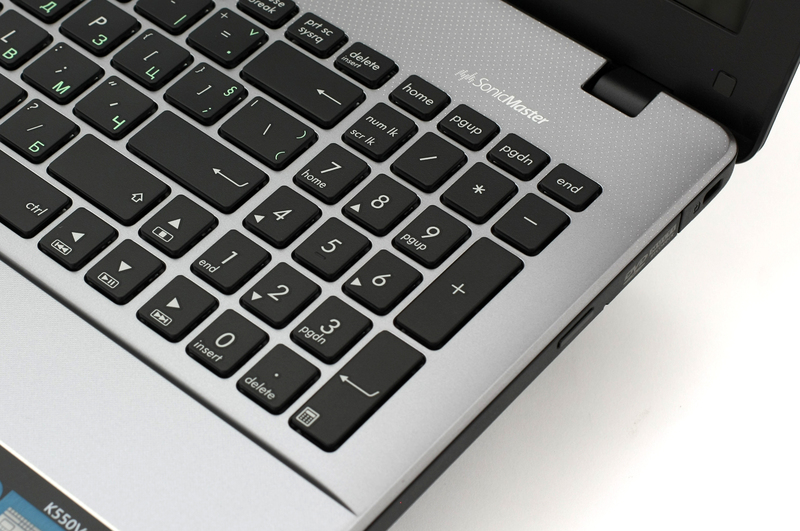 We can easily let that one slide since the user’s hands won’t be so near the vent but what we didn’t like about the cooling design is the heat building up in the center of the keyboard dispersing to the touchpad and wrist rest area. Temperatures reached as high as 47.9 °C while the touchpad area was around 41 °C. Slight discomfort can be felt during gaming or heavy workloads that require computing and graphics performance. 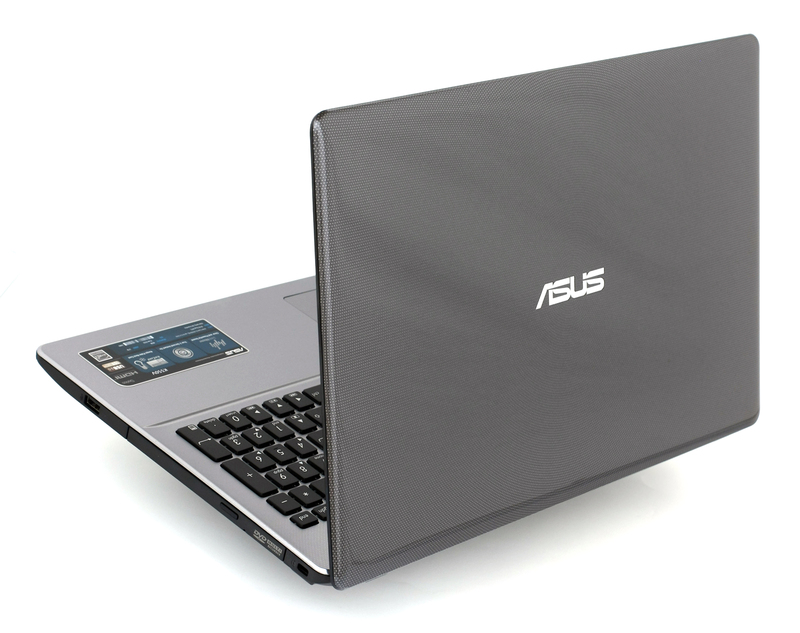 If you are looking for a solid budget performer, the ASUS X550VX is an excellent choice. It’s a bang for the bucks at just around $700 that include the speedy Core i7-6700HQ and the refreshed version of the GeForce GTX 950M with 2GB of GDDR5 memory. However, you need to be prepared to make some sacrifices along the way like build quality, battery runtimes and screen resolution. For a basic configuration, the TN panel is okay and matches today’s industry standards for the asking price but the resolution might fall short to some so we suggest aiming for the Full HD version at least. Also, the battery performance is rather poor if that’s somehow important to you. But if plan on using the notebook for gaming with an external monitor as a desktop replacement, the X550VX will do just fine. Just keep an eye on the internal and external temperatures because our tests show slightly higher than usual temps. Finally, build quality might pose some issues in the long run because the keyboard feels a bit spongy and takes away the good typing experience and the lid is slightly more flexible than we like it to be. Yet again, some of the drawbacks come naturally due to the excellent price/performance ration that the X550VX offers. Is there a aftermarket battery replacement, with a higher rating?